MTV Güik VJ Diego Alfaro made and posted a missing person's poster on the 777 Tour plane. I enjoyed watching Rihanna’s 777 Tour documentary on Fox Monday. But it could not have been an easy feat cramming footage from her travels to seven countries in seven days with 250 passengers into a one hour special. It’s not surprising that 777 Tour alumni like myself would have their own list of moments that were not captured in the film. 1) “Don’t Stop The Music” – When they played Rihanna’s “Unapologetic” over the intercom system, Janise Williams and her male buddy did what any diehard RiRi fans would do. They got up out of their seats and turned the left aisle near the emergency exit into a nightclub. When “Jump,” which samples Ginuwine’s “Pony,” and “Nobody’s Business,” her Michael Jackson-esque Chris Brown duet, came on, I was seriously tempted to do my two-step down the Soul Plane, Soul Train line. 2) “Stay” – Though there was a lot of complaining about all the long delays between stops, it never bothered me until it was time to leave Berlin (Day 5) and we camped out in customs for at least five hours. People were literally sleeping on the floor and underneath coffee tables. I remember seeing Rihanna’s entourage drive up at around 5 a.m. in a fleet of Benzes, signaling that we could finally depart. My buddy Wilson Honrado, a personality from Portugal’s Radio Comercial, dubbed us “The Waiters” since we had become experts at loitering. 4) “Where Have You Been” – Diego Alfaro, a VJ for Latin America’s MTV Güik, is my hero from the trip. When we boarded the 777 Tour plane in London (Day 6) as we prepared to head to New York, the final stop, we were greeted with one of the funniest things I’ve ever seen – a missing person’s poster taped on the walls throughout the plane. Diego is the desktop publisher behind this work of art. I laugh hard whenever I think about it. 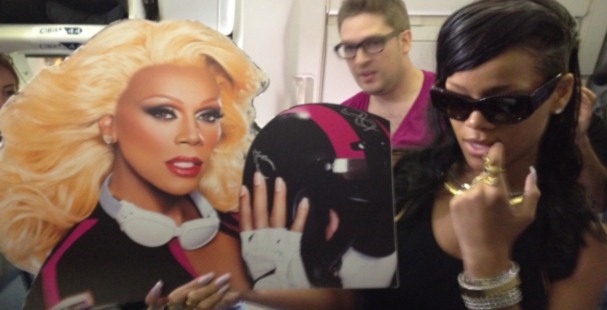 5) “Fresh Out The Runway” – Rihanna wasn’t the only supermodel diva on the plane. Cardboard Rupal was werking harder than anybody else in the friendly skies, thanks to my 777 Tour row mate Shawn “Hollaaaaaa” Hollenbach, the social editor for the Logo channel. When Rihanna came down the aisle to pour it up (Day 1), Cardboard Rupal got her picture with the hostess. I should have hung out more with Ru on the trip. She hit up all the best sites during the stops in the seven countries. The film Rihanna 777 Tour: 7countries7days7shows is available for purchase and is said to have double the footage.